"About sixty percent of our cadres who crushed the military operation "Ginihera" of the Sri Lanka Army in Muhamalai area were women. The credit for the Muhamalai victory goes to our women cadres," said Liberation Tigers of Tamil Eelam (LTTE) Jaffna district political head, Mr.C.Ilamparuthi, introducing Ms Pathmini Sithamparanathan at an election meeting held Saturday in Jaffna Veerasingham Hall, sources said. 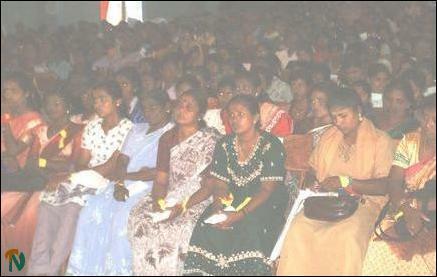 Ms. Sithamparanathan is the sole woman candidate contesting the Jaffna district in the Tamil National Alliance ticket. The event was organized by the Women Cultural Centre (WCC). "We treat the forthcoming general election as a weapon to obtain international recognition for our liberation struggle which has reached its peak in many dimensions," Mr.C.Ilamparuthi told the more than one thousand women participants from all parts of the peninsula attending the event, sources said. Women representatives shouted slogans stressing the urgency of electing a Tamil woman to parliament represent them at the commencement of the meeting, sources said. Mr.Ilamparuthi further said, "Tamil women need parliamentary representation to spotlight injustices, suppression and oppression they have been subjected to in the society. 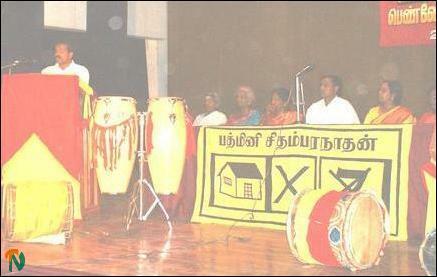 We would like to see Ms Pathmini Sithamparanathan of the TNA elected to parliament." "If we can gain international support and recognition for our cause in the forthcoming general election, it is equivalent to obtaining a separate state for us. 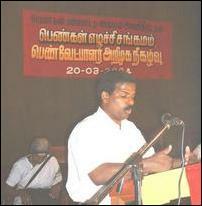 Hence all Tamil voters should vote for the TNA in full strength," he added. WCC President Ms M.Krishnaveni presided. WCC Co-ordinator Ms Sivarathi Rajkumar and LTTE political head of the women wing Ms S.Thamilini also addressed the event, sources said.